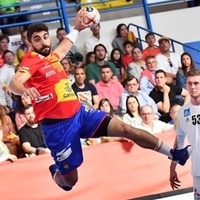 Spain exacted their revenge for the 28:29 loss away against Austria in the EHF EURO Cup on Thursday, though they were not able to decide the home match on Sunday until the last 10 minutes. After a poor start, Austria followed their hosts most of the way, and were even leading 28:27 with 10 minutes left. Six straight goals from Spain decided the game. Spain are now on six points alongside Norway, while Austria are still on two. The home side’s attacking play functioned very well from the start, and with the brothers Joan and Marc Canellas playing together in the back-court line, Spain pulled ahead 7:3. Several great saves from Thomas Bauer in the Austria goal in combination with a sharpshooting Janko Bozovic enabled the visitors to hang on. Spain moved three goals in front a few times, but Austria kept coming back, as both coaches rotated their squads. By the half-time buzzer however, Spain re-established their three-goal lead. Bauer’s save percentage dropped towards half-time, but his replacement between the posts, Thomas Eichberger, played his part in Austria catching up. They drew level at 19:19 four and a half minutes into the second period and took the lead at 28:27 with just over 10 minutes left. As Spain’s 5-1 defence finally began to pay off, the home team turned the one-goal deficit into a 33:28 lead with six goals in a row, which decided the matter.